The Wildlife Experience is an educational and entertaining museum that connects visitors with wildlife and habitats in a fun learning environment! A unique blend of interactive exhibits, large format film, fine art, natural history and community educational programs and events is unrivaled and provides The Wildlife Experience the opportunity to present information on the world’s wildlife and ecosystems that encourages discovery and understanding through fun and entertainment. The Wildlife Experience inspires an appreciation and respect for wildlife and the outdoors through adventure, experiences and education. 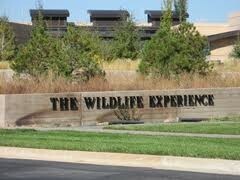 The Wildlife Experience is one of Colorado’s most unique venues that provides both indoor and outdoor event spaces for your event. Offering five unique and flexible spaces throughout the museum, it is the ideal location for fundraising events, banquets and presentations, accommodating groups of 10 to 2,000 people.